Yesterday we made some huge announcements in a live broadcast on Facebook. You can view the broadcast here, and there’s a summary of the keypoints below. You’ve learned French with Coffee Break French, and now it’s time to take your French on the road with Mark and the Coffee Break team. This first season of En Route was recorded in the south of France, in the area between Nice and Menton on the Italian border. In each episode Mark talks to people living and working in the area, so you’ll be hearing lots of different accents and speaking speeds. The Season Preview is already available and you can find this here on the website and on the Coffee Break French podcast feed. 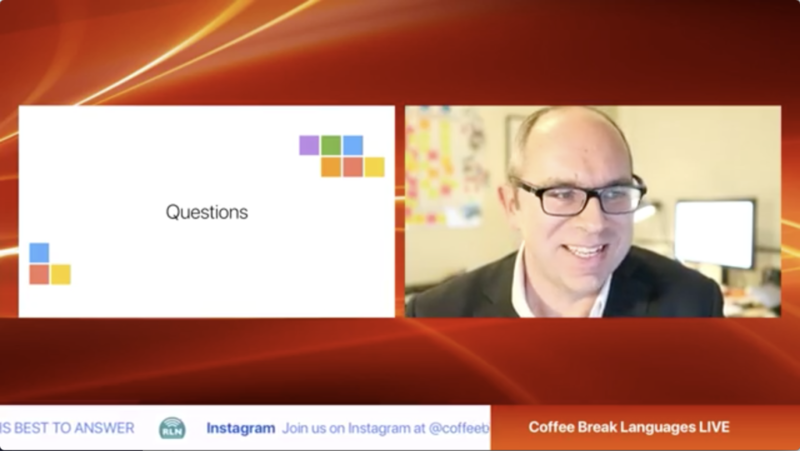 If you’d like to sign up for the premium version of the course which includes transcripts, bonus audio and exclusive video content, you can purchase the En Route course in the Coffee Break Academy. These courses for younger learners of French and Spanish are now fully available in our Coffee Break Academy. In High Five French, learner Emma is joined by native speaker Mathilde and children can learn along with Emma through a series of engaging video episodes, all filmed in France. Our presenters of High Five Spanish are native English speaker Sophie and her Spanish friends Marina and Miguel. High Five Spanish is set in the south of Spain and again features a series of video lessons which tell the story of Sophie learning Spanish. Both courses feature video content, audio materials, transcripts and notes for parents, activities and puzzles. Find out more about High Five French and High Five Spanish here. It’s easy to find materials in the language you’re learning on the internet, but it’s not always easy to find materials which suit your level. That’s why we’ve developed the Coffee Break Reading Club. Starting in January 2018, the Reading Club will provide weekly texts, delivered straight to your inbox. This service will be free of charge: you’ll receive a passage every week for one year. If you’d like to receive an audio version of the text along with vocabulary and an exercise/activity, you can purchase the Reading Club in the Coffee Break Academy. The Reading Club is aimed at learners who are working on or have completed Season 2 of our courses, or at a A2/B1 level in the language. It will be available in French, German, Spanish and Italian and you can find out more here. Currently our short introductory course, One Minute Languages, is available in 25 languages, from Arabic to Zulu. We’re delighted to be adding five new languages to the range, starting in December 2018. One Minute Czech, One Minute Slovak, One Minute Hungarian, One Minute Latvian and One Minute Icelandic will be published in weekly podcast episodes and a course featuring video versions of the ten lessons and a lesson guide will be available in the Coffee Break Academy. Stay tuned for more details of our launch. To find out more about One Minute Languages, click here. We decided that taking your language skills “on the road” was too good an idea to be limited to French, so we’ve started production on En Marcha con Coffee Break Spanish. Mark and the team visited the Andalucía region of Spain and recorded a series of interviews with locals. This new Spanish course will be launching in early 2018. Click here to find out more and to sign up for notifications about En Marcha. Let us know what you think about our latest announcements by posting a comment! The new Reading Club looks interesting – I am currently working through CB German 2. However the link above doesn’t seem to work at the moment … “Secure Connection Failed” … the same for 2 different browsers. Hi Trevor. Thanks – we’re glad you like the look of the Reading Club. Unfortunately there’s an issue with the hosting company for the Coffee Break Academy at the moment. It should be fixed very soon. I do hope that there will be a Coffee Break Spanish Season 5 to buy, much along the lines of Season 4! It is an excellent learning tool. I love it.